Lumbar pain can be some of the worst back pain for those who suffer from it. While seeing a doctor is an important step in finding relief, the support you provide to this area of the body is also important. If you’re looking for a pillow that offers this support, there are many options. Those listed below are some of the best lumbar pillows in particular to help reduce pain and alleviate stress on the back. 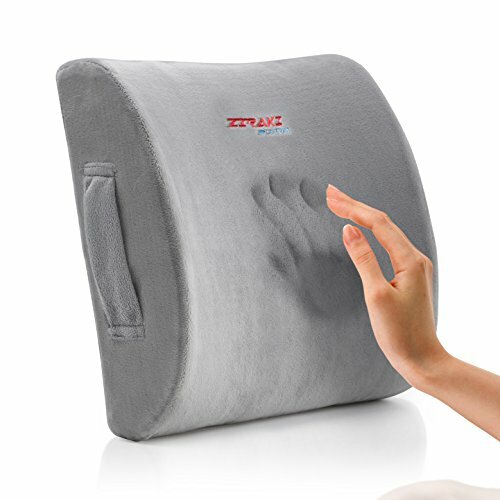 This pillow by Ziraki is designed to offer instant back relief as well as comfort for those who suffer from lumbar back pain. The memory foam contours to the spine to provide gentle support when you’re sitting upright. It can be used in an office chair, on the couch, in the car, or even in a plane! It’s designed to encourage perfect posture, which can further help support a healthy back and reduce pain on a daily basis. With standard density, this lumbar roll offers excellent lower back support for those who sit for most of the day. The attached strap easily secures onto office chairs, car seats, and even dining room chairs so you never have to sit without it. Thanks to the compact size, you can also take it with you while traveling or moving around the house. The high-quality materials ensure this will last a long time so you can enjoy lumbar support for years to come. The Therm-a-Rest lumbar pillow is one of the best lumbar pillows because it comes flat and packaged in a small box. However, within seconds it turns into a small yet supportive pillow when you inflate it. The one-handed valve adjustment makes it easy to control the amount of air inside of the pillow, which will give you customized support. For additional comfort, this pillow does contain die-cut foam that offers even more support where you need it the most. Made of high-quality memory foam, this pillow offers excellent support for the lower back to help reduce and even eliminate pain. It’s ideal for individuals who have chronic pain in their lower back but also great for individuals with arthritis, stenosis, and herniated discs. The ergonomic design contours to the back and the included straps mean you can attach it securely for use on the upper, middle, or lower areas of your spine. If you sit all day, then you may notice this helps quite a bit with correcting your posture as well. This pillow is designed to help ease lower back pain no matter where you’re sitting, as it comes with a convenient strap to secure to any type of chair. It’s made with orthopedic foam that keeps its shape and helps reduce slouching so you keep better posture and encourage better alignment in your spine. You can take this in the car, to the office, on the couch, or even on-the-go as you travel thanks to the compact design. This lumbar pillow is made of 100% high-quality memory foam that contours to your back to help provide the best support possible. Available in black, it also comes with a hypoallergenic mesh cover that helps keep you cool by constantly circulating air. To secure this, simply attach the straps on the side of the pillow to any surface, from office chairs to dining room chairs. It’s easy to remove, compact for travel, and lightweight as well. 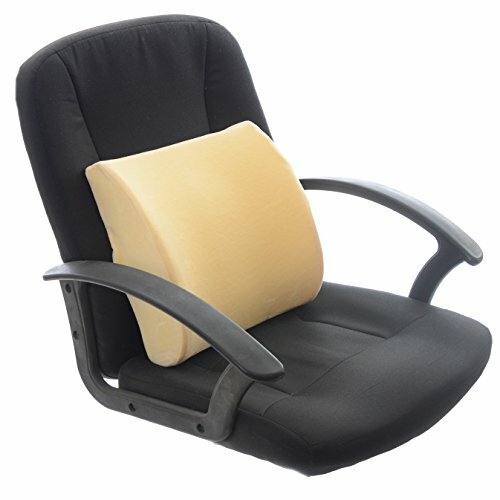 This affordable pillow is specifically shaped in a way that provides optimal support for the lumbar spine. It contours itself to your body in particular and can alleviate or reduce back pain when used on a regular basis. The exterior cover is made of a soft yet breathable mesh cover that you can wash and dry at home. It can also be used virtually anywhere, from the couch to an airplane when you’re traveling. The best lumbar pillows above can make a huge difference in the intensity of back pain you have in this area of your back. By using yours on a regular basis, you may notice that this area bothers you less and you’re able to live a more comfortable life. To choose which pillow is right for you, read through the descriptions and consider where you’d like to use it. By doing this, you’ll be sure to end up with the very best option out there.